Parks and open spaces are taking center stage in North America's urban renaissance as multi-purpose catalysts and vital connective tissue. The reuse and rehabilitation of extant infrastructure is creating innovative and inspiring new sites, and spurring a renewed civic aspiration for design excellence. As noted in previous City Shaping articles, consequential and noteworthy work is molding Houston, TX, Toronto, ON, and many other places with projects of varying scale that skillfully achieve ecological, social, and cultural objectives. Brackenridge Park, Japanese Garden. Photograph courtesy The Cultural Landscape Foundation. On a recent tour of San Antonio, TX, it became clear that the city best known as the home of The Alamo and River Walk is creating a significant and brilliantly interconnected system of parks and open spaces. San Antonio Mayor Ivy R. Taylor, at a March 2016 conference organized by The Cultural Landscape Foundation about landscape architecture and urban planning in Houston, outlined an ambitious goal: "In San Antonio, as we approach three hundred years of existence, we're trying to ... create [an] emotional relationship between place, history, ecology and people." 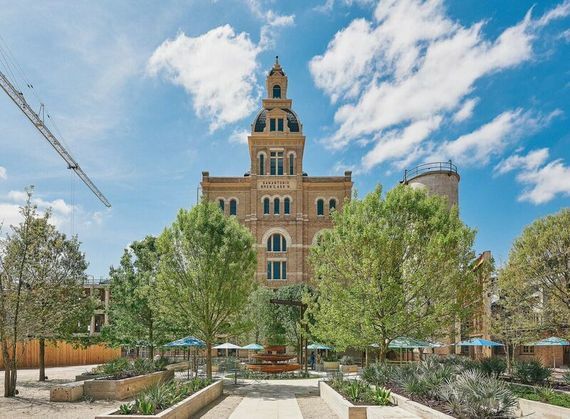 Based on the variety of projects I toured in San Antonio (some still underway), it's clear that civic leaders, design and planning professionals, foundations, conservancies, and other agents involved have ambition, vision, nerve, and, it appears, well-conceived game plans. The significant difference between the approaches in Houston and San Antonio is the depth of commitment from private philanthropists, which is considerable in Houston but noticeably less so in San Antonio, where, instead, a significant player is the San Antonio River Authority and its non-profit partner, the San Antonio River Foundation. The presence of Mayor Taylor and so many San Antonians at a conference focused on Houston was no surprise given the importance of rivers and associated waterways in each city. As Mayor Taylor stated: There's a "history of flooding that drives a lot of the infrastructure investments." 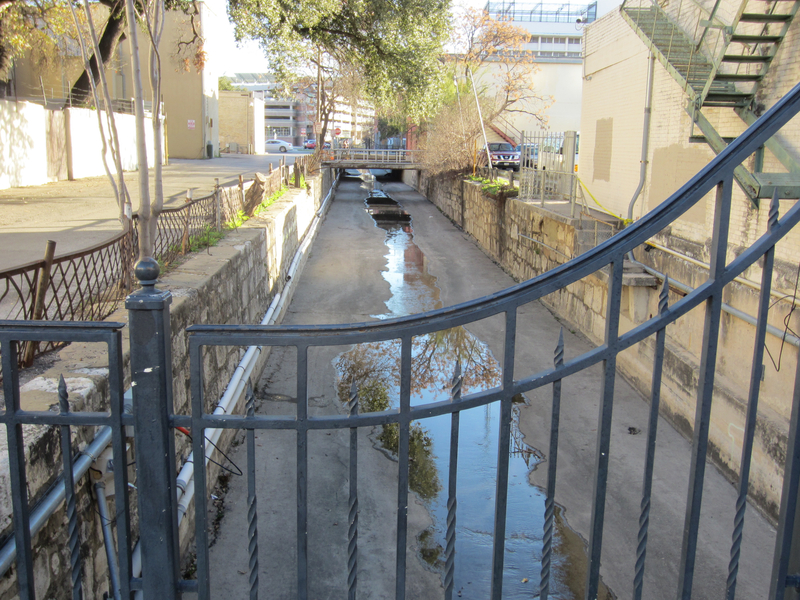 In fact, water management has long been part of San Antonio's history. When a group of historic missions along the San Antonio River was declared a World Heritage Site in 2015, the UNESCO designation highlighted "the substantial remains of water distribution systems" that linked the missions. As Mayor Taylor noted: "The natural environment is why San Antonio is where it is ... the river ... is central to our understanding of our shared history." San Pedro Creek adjacent to the Spanish Governor's Palace (present day). Photograph courtesy The Cultural Landscape Foundation. The San Pedro Creek is an omnipresent waterway in the city's history. The San Pedro Creek Improvements Project proposes to replace parking lots and derelict land along and proximate to the creek with four miles of trails that will bring nature into the urban environment, spur economic development, and provide flood control. San Pedro Creek adjacent to the Spanish Governor's Palace (proposed). Rendering courtesy the San Antonio River Authority. Bexar County and the San Antonio River Authority, in coordination with the City of San Antonio, are working with lead architects Muñoz & Company and lead civil design engineer Pape Dawson Engineering on the $175 million project. The waterway will also serve as a cultural lifeway linking neighborhoods and landmarks such as the Spanish Governor's Palace (a National Historic Landmark), Casa Navarro State Historic Site, and the Alameda Theatre (one of the last grand movie palaces built in America and the largest ever dedicated to Spanish-language films and the performing arts). Confluence Park. Rendering courtesy the San Antonio River Authority. The intelligently designed Confluence Park, by Lake Flato, will transform an industrial laydown yard into an interactive learning and recreational space with hiking and bike trails, and ample opportunities for families. An elaborate network of pipes and cisterns will facilitate stormwater management, and the River Foundation will implement educational initiatives that connect people with the park and instill a stewardship ethic for the area's waterways. As noted in the Rivard Report, the authoritative and meticulous chronicler of the city's activities and development, "The impetus and ethos behind the park's design is one that is less visible to the families: water and its critical relationship to ecosystems and the people that inhabit them." San Antonio Botanical Garden. Rendering courtesy the San Antonio Botanical Garden. 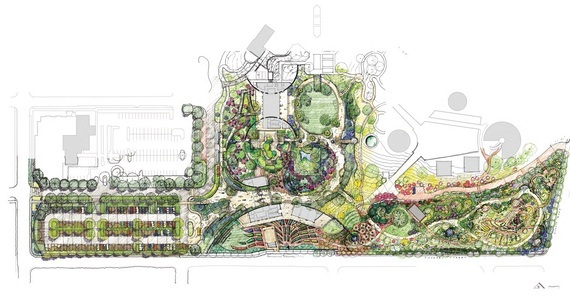 The San Antonio Botanical Garden, which operates under a public-private partnership with the city, is engaged in a $22 million expansion lead by Ten Eyck Landscape Architects; and, importantly, it will be transitioning full management from the public to the private side, the first public park to do so. Culinary Garden. Rendering courtesy the San Antonio Botanical Garden. 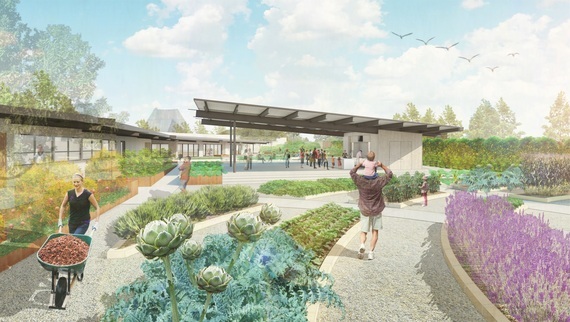 The completed project will include a culinary garden to promote health and wellness, a family adventure garden and a new visitor center focused on the iconic Emilo Ambasz-designed glass conservatory. In addition, the conservation-minded project will help tell the story of water, a critical challenge for the region, and a story made more compelling by the existence on site of the 1870's Brackenridge Waterworks reservoir. Hemisfair Park. Plan courtesy the Hemisfair Park Area Redevelopment Corporation. 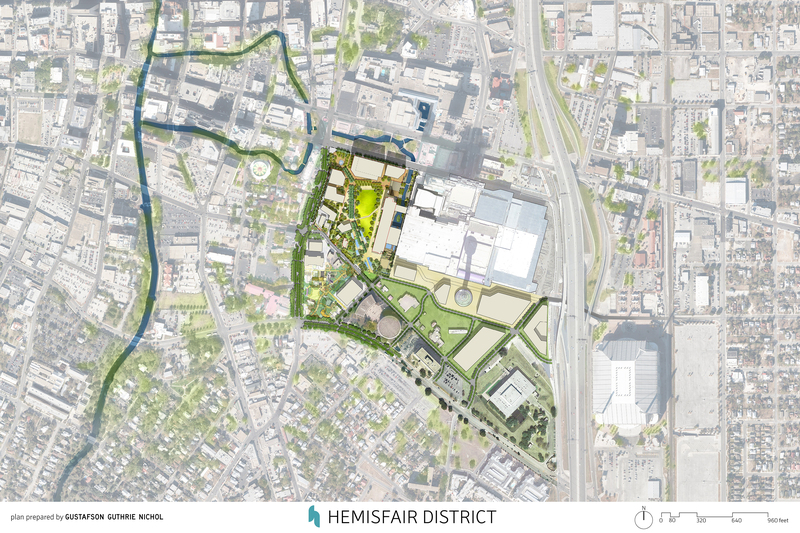 The Hemisfair Park Area Redevelopment Corporation (HPARC), formed in 2009 and charged with transforming the site of the 1968 World's Fair, is aiming high. Believing that great cities have great downtowns and great downtowns have great parks, HPARC wants Hemisfair to be San Antonio's Central Park, and they've hired Gustafson Guthrie Nichol to realize their vision. Hemisfair Park, Source Plaza. 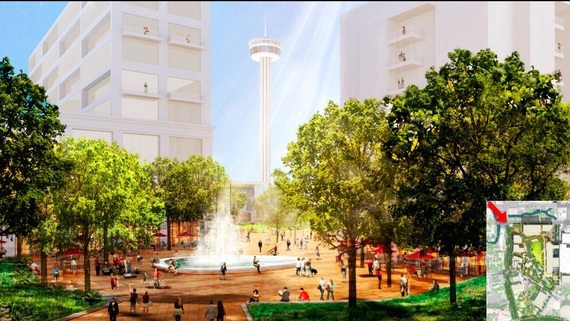 Rendering courtesy the Hemisfair Park Area Redevelopment Corporation. To make the park financially self-sustaining, they plan to lease fifteen acres of public land to private developers. The lease fees would go to Hemisfair's budget and operations, and the project's advocates say it will bring in thousands of new residences and a pedestrian-friendly environment, along with tens of thousands of square feet of space for commercial use. Pearl Plaza at The Pearl. Photograph © Nick Simonite. An exceptional example of rehabilitation and design excellence is the Pearl Brewery complex. Established in 1881, it became, under the leadership of Emma Koehler, the state's largest brewery by 1916. Following its closure in 2001 and subsequent sale, the site underwent reinvention (Ten Eyck Landscape Architects, landscape architects; Lake Flato, early master plan architects, with Rialto Studio, landscape architects; and Ford, Powell, Carson, historic preservation architects) and today features hundreds of apartments, as well as restaurants, retailers, and a farmers market. River walk at The Pearl. Photograph courtesy The Cultural Landscape Foundation. What distinguishes the Pearl is the attention to detail. As Bill Shown, managing director of real estate at the equity investment firm Silver Ventures, stated: "There is not one piece of memorabilia that has been put on display. Everything that appears has been given a purpose. It is functional." Layers of history at Brackenridge Park. Photograph courtesy The Cultural Landscape Foundation. What's happening in San Antonio indeed reminds me of what's happening in Toronto and Houston, where new parks and open spaces are being built to a high level of design. But there are also heritage spaces, which, in San Antonio, includes Brackenridge Park, that are integral to city's identity. My tour through San Antonio was organized by the Brackenridge Park Conservancy, which manages the 343-acre park on land originally donated to the city by George Washington Brackenridge in the late nineteenth century (with a subsequent donation by Emma Koehler). It's a significant cultural landscape with a layered history, including an early-eighteenth-century Spanish colonial settlement and archaeological evidence of human habitation dating back 11,000 years. As San Antonio moves forward, it has the opportunity to leverage its rich past and its unique cultural palimpsest. We've seen what some entrepreneurial San Antonians have done with major projects in New York City: Betsy Barlow Rogers, founder of the Central Park Conservancy; Warrie Price, founder of the Battery Park Conservancy; and Robert Hammond, co-founder of the High Line. The good news is that city boosters have opportunities to find similar success at home. San Antonio's World Heritage-designated missions could become the jewels in the crown of a congressionally designated National Heritage Area, which would be a first for Texas.